Skincare can be intimidating if you don’t know what your skin needs. The type, texture and condition are all factors in which we all try to understand, but do we really know our skin? 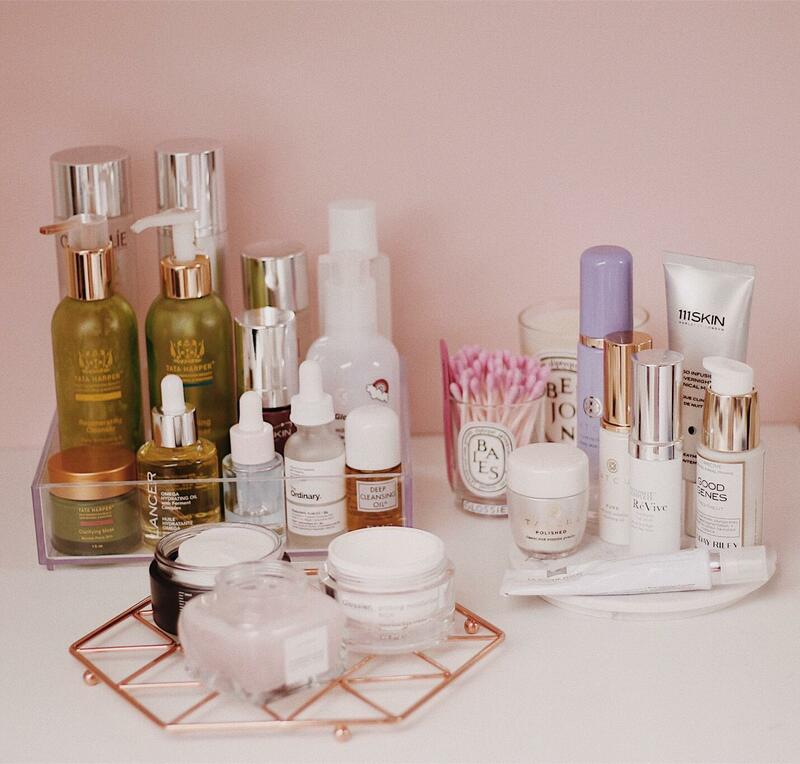 You may have read my recent skincare post, in which I briefly stated my current skincare journey and why I had to stop using certain products. Since then I have really stripped my skincare down after trialling various products and alas nothing was getting through to my stubborn skin. I have learnt the hard way that my skin doesn’t like various ingredients and in this post I am going to break them down to discuss what ingredients I can and can’t use on my skin. I just deal with my skin accordingly and take each day as they come. SPF – I can not stress enough how important SPF is during your everyday routine, not just during the summer. If the skin is unprotected and exposed to the UVA and UVB rays it can cause premature ageing, skin burning and even in extreme cases, cancer. 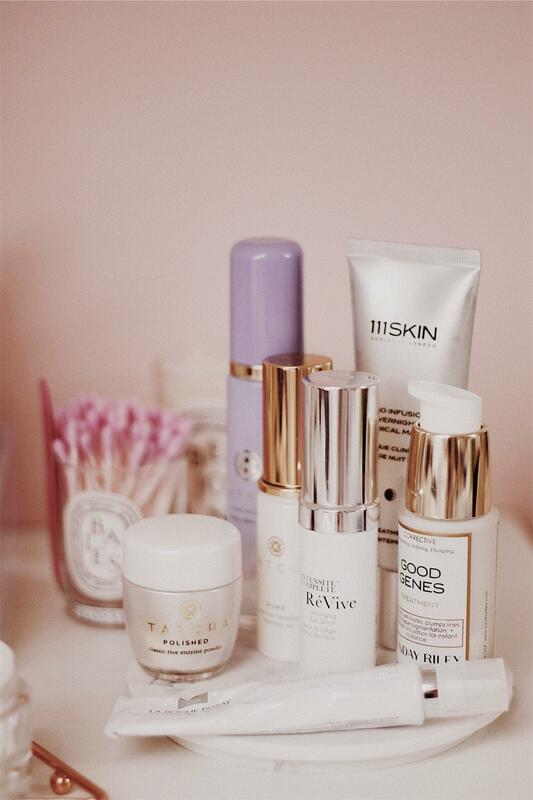 So incorporating a decent SPF into your routine is the most important step in any routine. My favourite for everyday use is the Fresh Peony Brightening UV Shield SPF 50, and for holidays and the summer time, Ultra Sun High 30 SPF face – this one has added anti-ageing for sensitive skin. Retinol – My skin reacts well to retinol, just in small doses. Retinol helps to accelerate skin renewal and is mostly used for its anti-ageing properties however it is also a power ingredient for acne-prone skin. 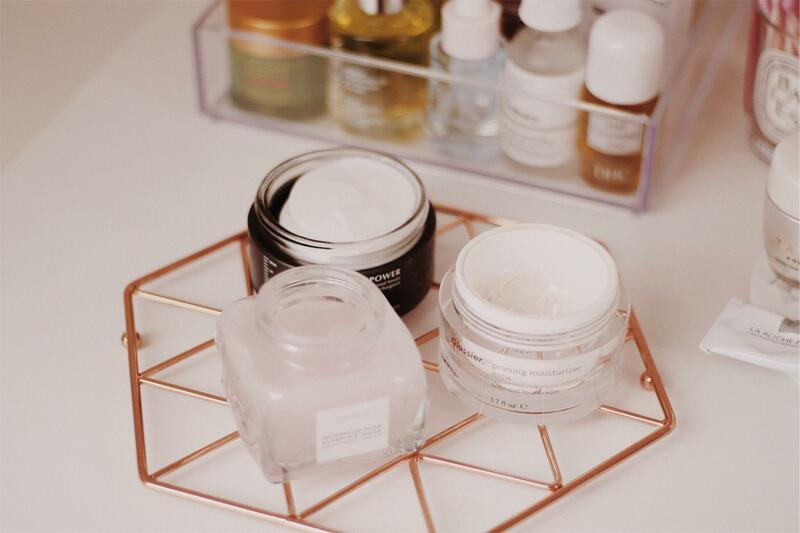 My go-to retinol induced products are Dr Dennis Gross Ferulic + Retinol Recovery Peel Pads, these are a quick all-in-one product that I like to use once-twice a week. My skin also enjoys the La Roche Posay Redermic Retinol Treatment, this specifically targets uneven skin tone and dark spots – perfect for scaring. AHA’s – Alpha Hydroxy Acids, glycolic and lactic acid. Now AHA’s are a funny one for my skin, it loves lactic but not glycolic. I learnt recently that glycolic acid can clog the pores and now it’s on my list of ingredients-to-avoid. My favourite lactic acid product is Sunday Riley Good Genes, however they are reformulating it to be a Glycolic acid treatment and I couldn’t be any more upset –if it’s not broke, don’t fix it! AHA’s help to gently exfoliate the top layer of the skin, and is perfect for acne-prone skin because physical exfoliators can be harsh on the skin. Essences’s – Now I do love a good essence, they allow serums to work deeper and harder within the skin. I also find them super hydrating and they feel lovely on the skin. My absolute favourite essence is the Omorovicza, omoressence – it instantly hydrates, reduces inflammation and redness. Other essences I enjoy are SK-II facial treatment essence and Saturday Skin daily dew treatment essence. One that my skin doesn’t get on with because it has glycolic acid in it is the one by Caudalie. I think everyone should add an essence into their routine, just find the right on for your skin. I’ve been trying to cut down my skincare, back to the basics but I find it very hard not to incorporate extra products and ingredients. Here are my current routines and the reasons for using each product and main ingredients. Cleanse: Odacite Black Mint, this is refreshing, purifying and deep cleansing. Main ingredients are activated charcoal & rhassoul clay, which deeply clears out pores and restore skin’s softness. Peppermint and tea tree, minimises the appearance of pores and wakes up a tired complexion. Odacite is a natural brand that uses the highest quality ingredients or plant extracts and oils. Serum: Evolve Hyaluronic Acid serum, ultra hydrating serum packed full of hyaluronic acid and pomegranate extract. Moisturiser: Malin and Goetz Replenishing face cream, amazing for added moisture and hydration, with no nasty ingredients or harmful chemicals. SPF: Fresh Peony SPF 50, a lightweight and hydrating UV protector. Eye Cream: Elemental Herbology Eye Elixir, reduces the appearance of puffiness and dark circles, whilst smoothing and hydrating the skin. Cleanse: Caudalie Cleansing Oil, I have gone through 3 bottles of this so far and will continue to repurchase it. The sweet almond oil nourishes the skin whilst breaking down all makeup and waterproof mascara. Second Cleanse: Odacite Black Mint, like my morning routine I use this cleanser because it’s purifying and helps to minimise the appearance of pores. Serum: Evolve Hyaluronic Acid serum, I use this serum twice a day for ultra hydration. Moisturiser: Votary Super Seed Cream, provides deep moisturisation and nourishment for skin recovery. I mix this cream with an oil to add extra hydration because it leaves the skin with a smooth matte finish. Treatment: Caudalie Overnight detox oil, main ingredients include; grape seed, neroli, rose hip and carrot oils, to provide antioxidant, purifying, regenerating and detoxifying properties. I’ve been using this oil for a few evenings now and although I expected it to make my skin purge to start with, it has actually helped to reduce redness, blemishes and skin tone. Eye Cream: Elemental Herbology Eye Elixir, same as my morning routine. Face masks are my favourite treat for my skin, I have a collection of different treatments for different skin needs. 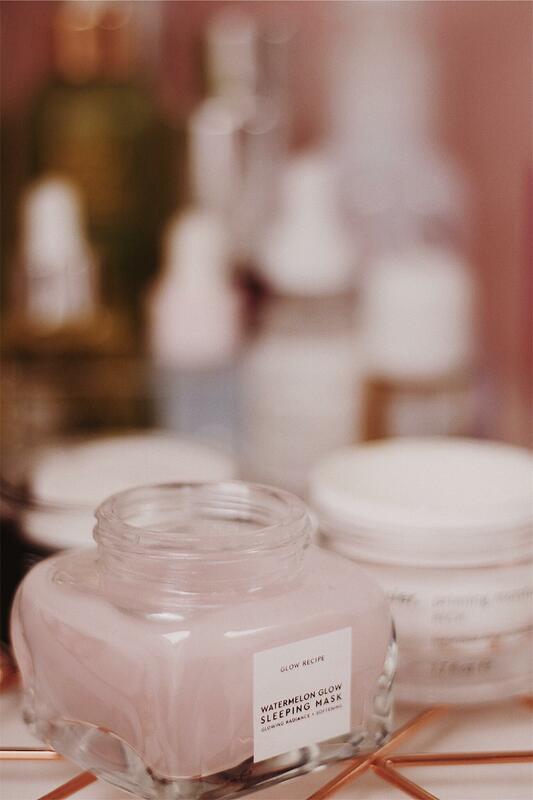 My go-to treatments are: Glow Recipe Watermelon Glow Sleeping Mask, I use this when my skin needs a light pick-me-up, it hydrates and also contains AHA’s for exfoliation. 111 Meso Infusion Overnight Clinical Mask, this gel mask helps enhance radiance, hydration and also tightens the skin, I use this when my skin feels dehydrated and dull. Oskia Renaissance Mask, my go-to mask for a glow, it contains papaya enzymes to help gently exfoliate the skin. 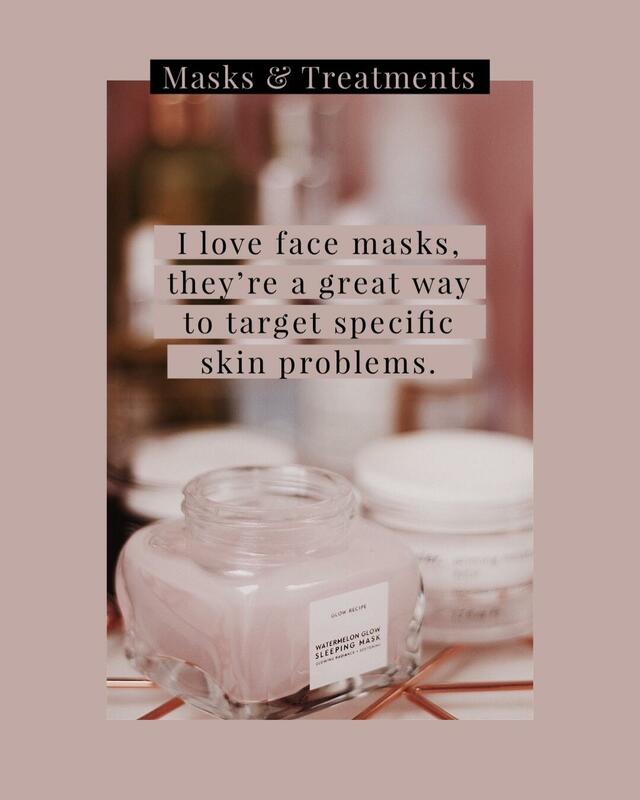 Tata Harper Clarifying Mask, I use this one as a spot treatment as and when I need it, it offers an enzymatic peel effect to correct uneven skin tone, redness and blemishes. Glossier Moisturising Moon Mask, this is my favourite mask for hydration. I have a lot of masks in my skincare stash but these are my top 5, I will always reach for one of these masks depending on my skin concern. I hope that this post has simplified a few different terminologies and ingredients if you to get overwhelmed by skincare. 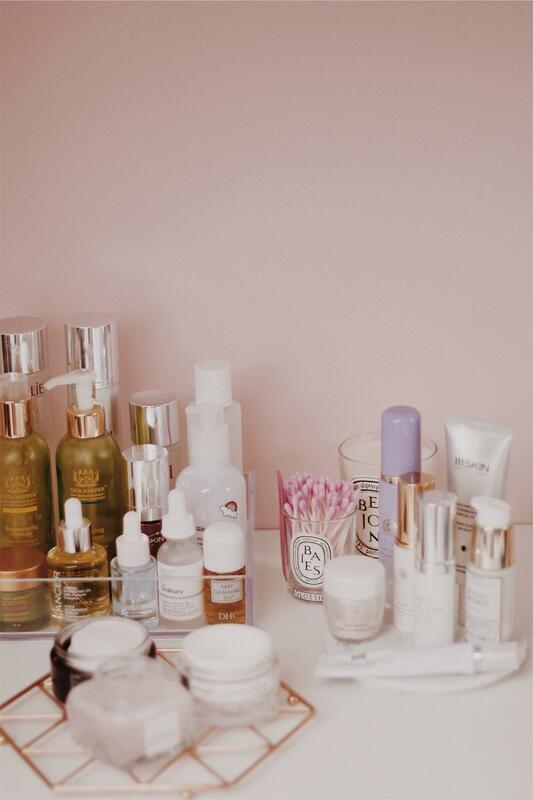 Let me know any of your skincare concerns as I would love to chat skincare with you, let me know if this post has helped or if you’ve used any of the skincare mentioned in this post also.